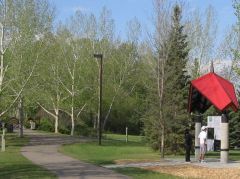 For many years, the communities of central Alberta have been meeting regularly through the Central Alberta Regional Trails Society (CARTS) to discuss ways to promote trails in this part of the province. 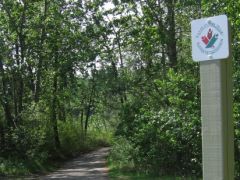 Alberta TrailNet (ATN) and the Trans Canada Trail Foundation (TCT) have offered support and expertise as Central Alberta communities and volunteers have worked together to help foster support for trail initiatives. Here is an update on what has been achieved in the last few years and a glimpse at what is on the horizon for trails in central Alberta. - A little more than two years ago, the map for the TCT was changed in Alberta to include a trail linking communities from Penhold to Wetaskiwin. This was the culmination of several years of work by volunteers and communities in central Alberta. - Once central Alberta had a registered section of TCT, CARTS was able to hire a TCT Coordinator (Derry Armstrong) thanks to funding support from the TCT Foundation. - CARTS realized that limited funding was available for trails. Central Alberta communities brought forward a resolution at the Alberta Urban Municipalities Association's annual general meeting to ask the Alberta government to better fund trails in the province. This resolution was passed with strong support from the AUMA. - In order to link communities within Central Alberta, several bridges will be necessary. The two key bridges are located between Blackfalds and Red Deer over the Blindman River and in Ponoka over the Battle River. CARTS helped municipalities in those regions apply for and receive funding from the TCT Foundation for the engineering of both of these bridges. We are currently working with communities to develop a plan to get these bridges built and in the past year, we received funding commitments of up to $400,000 towards the construction of these two bridges. ATN has committed to fund $100,000 towards each bridge and TCT Foundation has committed to fund $85,000 towards the Battle River Bridge and will also provide funding for the Blindman Bridge. The TCT has also been approached to provide bridge funding. - The Town of Ponoka is currently working on a grant application to ATN and TCT for trails adjacent to the planned bridge over the Battle River. The Town has set aside a significant amount of funds for trail development and we hope to be able to make an announcement soon on the progress of this project. - CARTS has been working closely with the Town of Lacombe, the Town of Blackfalds, the County of Lacombe and the County of Red Deer on a subcommittee originally struck to promote the building of the pedestrian bridge over the Blindman River. The committee continues to make progress on the bridge planning, but has also been working on a unique opportunity to build a trail linking these communities. We hope to make an announcement on our progress in the near future.